Its seaside appeal and tidy, litter-free streets make it the kind of place that affluent Vietnamese couples choose to retire to, spending their final days watching the ocean and walking the promenade. For foreign visitors its attractions are less obvious, though it’s certainly a good spot to sample some fresh seafood. Its sprawling layout and huge boulevards means it’s something of a sweaty business getting around in the hot summer months (unless you have wheels). During the American War there was considerable South Vietnamese, US, VC and South Korean military activity in the area. The mayor of Quy Nhon, hoping to cash in on the presence of US troops, turned his official residence into a large massage parlour. 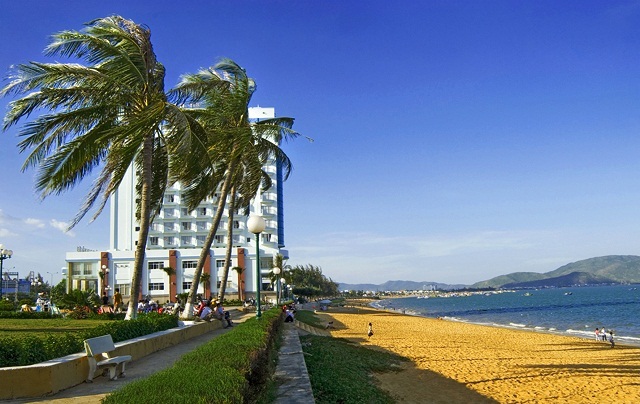 The long sweep of Quy Nhon’s beachfront extends from the port in the northeast to the hills in the south. It’s a beautiful stretch of sand and has been given a major facelift in recent years, making it almost as nice as Nha Trang, but with a fraction of the visitors. At the top end, the nicest section is near the Saigon Quy Nhon Hotel, where a grove of coconut trees lines the road. At dawn and in the evenings this area is packed with locals practising t’ai chi. South along the shore, the waterfront opens up to a parklike promenade, punctuated by large hotels. Here the beach gets more beautiful and secluded, away from the bustle of town. At night the bright lights of the squid boats give the illusion of a floating village far out to sea. In the distance you can see a giant statue of Tran Hung Dao giving the Chinese the finger on the far headland. It is possible to climb the statue if the door is open and peek out through the eyes. Heading south, a striking socialist-realist war memorial dominates a small square. (admission 10,000d; 8-11am & 1-6pm) This pair of Cham towers sits within the city limits in a pretty park. Steep steps lead up to the temples, which are open to the sky. Atypically for Cham architecture, they have curved pyramidal roofs rather than the usual terracing. The larger tower (20m tall) retains some of its ornate brickwork and remnants of the granite statuary that once graced its summit. The dismembered torsos of garuda (half-human, half-bird) can be seen at the corners of the roofs. Take Ð Tran Hung Dao west away from the centre and look out for the towers on the right. (28 Ð Nguyen Hue; 7-11am & 2-5pm Apr-Sep, 7.30-11am & 1.30-4.30pm Oct-Mar) This small museum features exhibits on regional history. The entry hall focuses on local communism, including an interesting silk print (by Zuy Nhat, 1959) showing a fat French colonist sitting aloft mandarins, in turn supported by bureaucrats, and cruel bosses, with the struggling masses supporting the whole ensemble. The room to the left has a small natural history section and some Cham statues, while the rear room has the bulk of the impressive Cham collection. The room to the right of the entrance is devoted to the American War, with local relics such as the ‘Spittoon of Heroic Vietnamese Mother Huynh Thi Bon’. Leprosy may not conjure up images of fun in the sun, but this really is a lovely spot. As leper hospitals go, this one is highly unusual, a sort of model village near the seafront, where treated patients live together with their families in small, well-kept houses. Fronting the village is Quy Hoa Beach, a lovely stretch of sand and a popular weekend hang-out for the city’s small expat community. 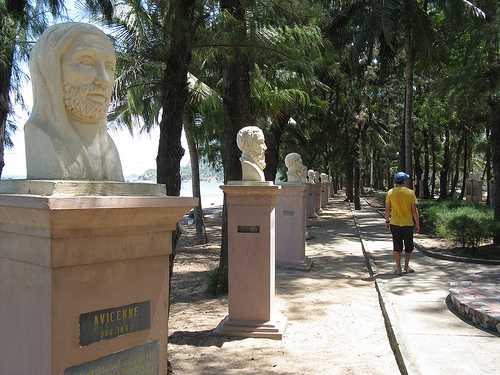 The hospital grounds are so well maintained that it looks a bit like a resort, complete with a guitar-shaped pavilion and numerous busts of distinguished and historically important doctors, both Vietnamese and foreign. Depending on their abilities, the patients work in the rice fields, in fishing, and in repair-oriented businesses or small craft shops – one supported by Handicap International produces prosthetic limbs. Just up from the beach, there’s a dirt path to the hillside tomb of Han Mac Tu, a mystical poet who died in 1940. If travelling by foot or bicycle, continue along the road past Queen’s Beach until it descends to the hospital’s entrance gates, about 1.5km south of Quy Nhon. It’s hard to miss the 17m-high Buddha (built in 1972) heralding Quy Nhon’s main pagoda, set back from the road by 143 Ð Tran Cao Van. The pagoda was founded in 1715 by a Chinese merchant, and the monks who reside here preside over the religious affairs of the city’s active Buddhist community. Mosaic dragons with manes of broken glass lead up to the main building, flanked by towers sheltering a giant drum (on the left) and an enormous bell. Inside, in front of the large copper Thich Ca Buddha (with its multicoloured neon halo) is a drawing of multi-armed and multi-eyed Chuan De (the Goddess of Mercy); the numerous arms and eyes symbolise her ability to touch and see all. This stony little beach at the foot of Ganh Rang was once a favourite holiday spot of Queen Nam Phuong. There’s a cafe and great views back over Quy Nhon. To get here, take Ð An Duong Vuong to the far south end of Quy Nhon’s beachfront and continue as the road starts to climb. After it crosses a small bridge, pay the entrance fee (5000d). It’s accessible by bicycle or xe om (motorbike taxi; 25,000d). Quy Nhon offers great value for money, and most places are right on or just off the sparkling shoreline. The main strip for travellers is around Ð An Duong Vuong on the south side of town. ( 056-384 7763; 8 Ð An Duong Vuong; r 160,000-250,000d) Owned by a very friendly lady, and offering excellent travel information and bikes for hire. Boasts clean rooms with satellite TV; those with sea views cost a little more. ( 056-374 7699; [email protected]; 8 & 24 Ð An Duong Vuong; r 160,000-300,000d) Under the same ownership, these two hotels confusingly share the same name. Number 8 is slightly more atmospheric, with clean rooms (some with sea views and balconies). Number 24 is even more kitsch (some rooms even have fake plastic trees!). Bicycles (35,000d per day) and motorbikes (150,000d) are available for rent. Mr Thoai, the friendly owner, speaks good English. ( 056-374 6900; www.hoangyenhotel.com.vn; 5 Ð An Duong Vuong; r 500,000-710,000d; ) A 10-storey concrete hotel overlooking the beach with good-value rates given the rooms’ spec and space. Secure a sea view, as the rates aren’t much higher and include breakfast. The hotel’s shady shoreside garden cafe is very popular for drinks. ( 056-384 6377; www.seagullhotel.com.vn; 5 Ð An Duong Vuong; r US$35-45) This large oceanfront hotel has a three-star wing and more modern four-star accommodation. All rooms have generous balconies and it’s located by a beautiful section of beach that’s perfect for swimming. ( 056-384 0132; www.avanihotels.com/quynhon; Bai Dai Beach; r US$118-136, ste US$168) Stylish oceanfront resort, set on a lovely private beach 15km south of town, that exudes taste – there’s a subtle Cham influence to the design. The spacious rooms, with stunning open-plan bathrooms, all face the waves. T’ai chi, yoga and snorkelling trips are offered and the spa is excellent. While the nearby Life Resort charges nonguests US$10 to lounge on their private beach (whether they’ve dined at the restaurant or not), if you head 2km south there’s an even better beach (that costs a fraction of the price). Bai Bau (admission 10,000d) is a beautiful white-sand crescent no more than 150m wide, sheltered by rocky headlands, with mountains for a backdrop. It can get busy on the weekend and during Vietnamese holidays, but midweek you’ll likely have the place to yourself. Bai Bau is well signed, just off the road to Song Cau, about 20km south of Quy Nhon. From Quy Nhon it’s around 70,000d by xe om (motorbike taxi) or 175,000d in a taxi. Quy Nhon also has lots of delicious street food all around the town centre. (12 Ð An Duong Vuong; mains 35,000-80,000d; 7am-10pm) Barbara has moved on, and the cafe has a new location but this place remains a popular meeting point thanks to the reliable travel information and Western treats: pizza, pasta, fish ‘n’ chips (50,000d), international breakfasts and Earl Grey tea. Accommodation is also available, but there’s better value elsewhere. (141 Ð Tran Cao Van; mains 10,000-20,000d; 8am-8pm) Located next to Long Khanh Pagoda, this hole-in-the-wall serves vegetarian meals in basic surrounds. The mixed plate is filling and hearty. ( 056-651 2675; 94 Xuan Dieu; dishes 50,000-150,000d; 11am-10pm) Likeable, very popular seafood restaurant with gingham tablecloths and views over the bay. Feast on delectable dishes including sweet soft-shell crab, hot and sour fish soup and green-mango prawn salad. (1 Ð Tran Doc; dishes 40,000-250,000d; 10am-10pm) Super-fresh seafood – select yours from the bubbling tubs and tanks full of live crabs, shrimp and fish. There’s also an upstairs dining area with a balcony. The seafood hot pots are legendary. (Cho Lon, Ð Tang Bat Ho; 6am-4pm) Bustling central market where street sellers spill over into the surrounding roads. Great for photo opportunities. (www.nguyennga.org; 91 Ð Dong Da; 7.30am-4pm Mon-Fri, 8am-1pm Sat) Sells lovely homemade weavings, handicrafts, clothing and jewellery, with the money going towards running a centre for disabled students. Barbara’s: The Kiwi Connection ( 056-389 2921; www.barbaraquynhon.weebly.com; 12 Ð An Duong Vuong) Free tourist information including bus and train timetables and tickets, city and countryside tours, bike and motorbike hire, local maps and internet access. Binh Dinh Tourist ( 056-389 2524; 10 Ð Nguyen Hue) Government-run tourist office. Vietcombank (148 Ð Le Loi; 7.30am-3pm Mon-Sat) With ATM. Vietnam Airlines ( 056-382 5313; www.vietnamairlines.com; 1 Ð Nguyen Tat Thanh) links Quy Nhon with Ho Chi Minh City (HCMC) and Hanoi. There’s a minibus transfer (40,000d) for airline passengers between the Vietnam Airlines’ office and Phu Cat airport, 32km north of the city. Quy Nhon bus station ( 056-384 6246; Ð Tay Son) is on the south side of town, with very frequent buses to Quang Ngai (65,000d, 3½ hours, hourly), Nha Trang and towns in the central highlands including Pleiku (82,000d, four hours, six daily). It’s also possible to get a bus all the way to Pakse (from 388,000d, 20 hours, four per week) in Laos, crossing the border at Bo Y. The nearest mainline station is Dieu Tri, 10km west of the city. Only very slow local trains stop at Quy Nhon train station ( 056-382 2036; Ð Le Hong Phong) which is at the end of a 10km spur off the main north–south track. Get to/from Dieu Tri by taxi (160,000d) or xe om for around 75,000d. Destinations include Quang Ngai (118,000d, three hours) and all major towns on the main north-south line.